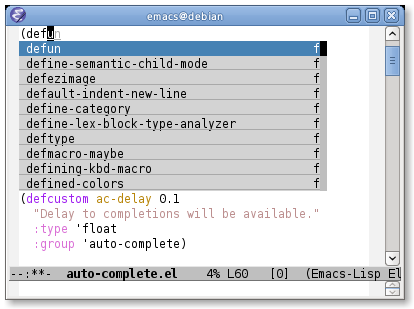 auto-complete-mode is the most intelligent auto-completion extension for GNU Emacs. Auto Complete Mode renews an old completion interface and provides an environment that makes users could be more concentrate on their own works. (add-to-list 'load-path "~/.emacs.d")    ; This may not be appeared if you have already added. This page was last edited on 24 September 2012, at 04:08.